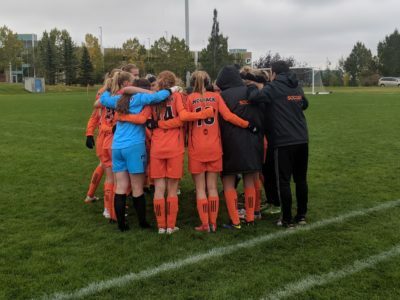 The WolfPack women’s soccer team lost two tough games on the road against the University of Alberta Pandas and the Mount Royal University Cougars. The WolfPack women’s soccer team lost their first game of the weekend 5-0 to the Pandas, the top team in Canada West Prairie division. The game was played on Sept. 15 at Foote Stadium, in Edmonton, Alberta. The star player for the Pandas was Karissa McNutt who had a goal and two assists. The Pandas had 26 shots. TRU was outshot 12-3 in the first half and 14-4 in the second half. The Pandas led 1-0 at half-time and scored four goals in the second half. Nicole Palladino, Sydney Daines, Aly Parth and Ann Dunn scored goals for the Pandas. Robertson made 5 saves in the game whilst the pandas had 26 shots in the game. UoA moves to 3-0 in the season, while TRU falls to 1-2. “5-0 is not a positive result but I am treating it as a step forward in our growth and development,” Shantz added. After the loss to the Pandas, things didn’t get any easier for the ’Pack as they lost 4-1 to the Mount Royal University Cougars. TRU conceded four goals in an eleven-minute span in the second half. The Cougars had a goal disallowed in the first half for offsides. TRU was outshot 15-8 by the Cougars. Coach Shantz and his girls will be hoping for better fortunes in their road trip to UVic and UBC after a tough weekend in Alberta. “No excuses though. We need to be better in our second halves. We were scoreless after the first half. In the second half, Camryn Curts rattled one off the crossbar. The wheels came off in the 68th minute. We were very disorganized. We are looking at it as fatigue. We will be addressing it and regrouping for our road trip to UVic and UBC next week,” Shantz concluded.